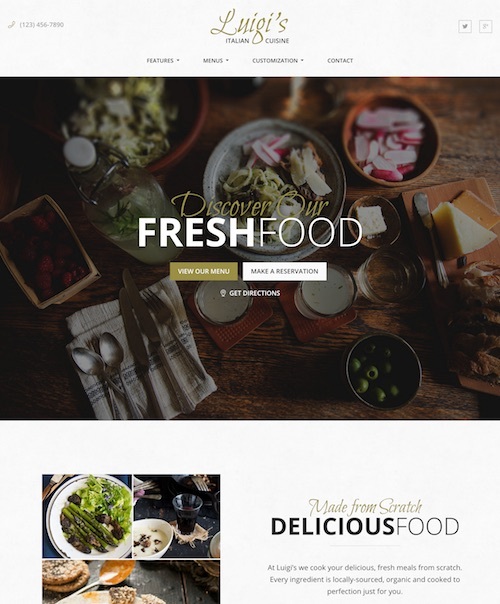 This is a collection of the best food and restaurant WordPress themes built for restaurants, cafes, pubs, coffee shops, bars, bistros, and other food and eatery websites. If you own a restaurant or food business these days it’s critical to have an online presence. WordPress makes it easy and inexpensive to create a professional and attractive restaurant, cafe, coffee shop, pub or bar website. The WordPress themes below are specifically designed for food and restaurant websites and include a range of restaurant specific features. Functionality and features such as custom menu templates, integrated Google maps, contact information section, daily specials, photo galleries and some even include a built in reservation system. Whether you run a fine dining restaurant, a small cafe, or a corner pub you should find a solution for your website below. 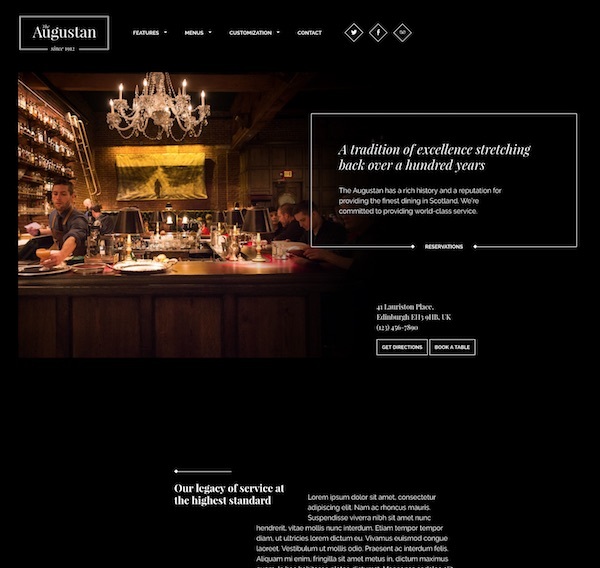 Augustan is a premium restaurant WordPress theme with a traditionally elegant design for high-class restaurants. 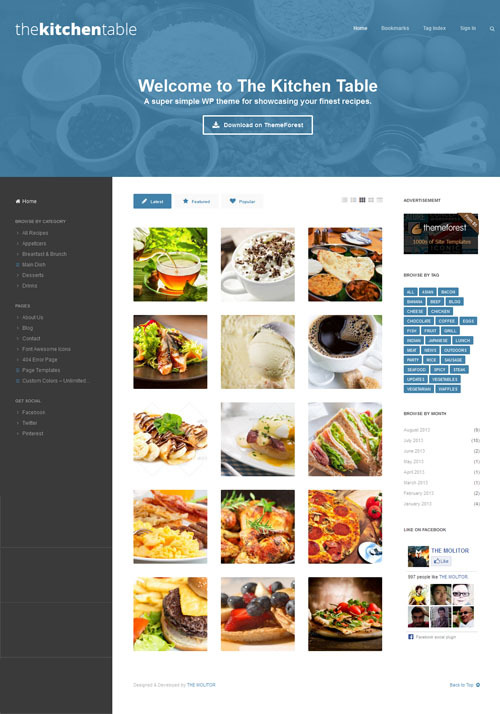 The theme is from Theme of the Crop – a shop that specialises in food and restaurant themes and plugins for WordPress. The Augustan theme has easy setup and customization options to choose fonts and colors etc to match your brand. It also comes with all the functionality you need to run a top notch restaurant website. Features include: advanced reservation functionality, food and drink menus, business profile, reviews and testimonials, create and manage events and discounts, email templates, search engine optimization for Google’s local business listings and more. 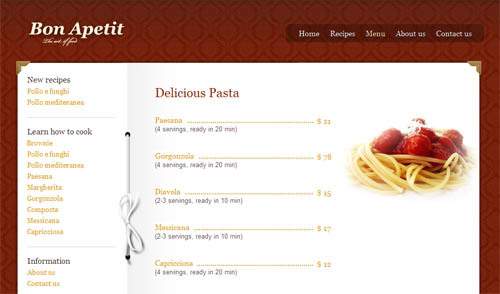 Luigi is a stylish restaurant WordPress theme designed for fine dining restaurants, Italian bistros or any other restaurant, café, or bar with a touch of class. The premium theme from Theme of the Crop has been carefully designed and expertly developed to ensure you have a great looking and easy to use and customize website for your restaurant. Luigi has a smart homepage builder that helps you easily build a beautiful custom homepage for your website. It has smart customization options so you can change the colors, fonts etc, and integrates with the Typecase plugin so you can use any of the hundreds of fonts from Google. Some of the other key features of the theme include: Events support (show off your evening events, weekly specials and more with a stunning events calendar), online reservation functionality, photo galleries, beautiful menu functionality (with icons, supplier notes, discounted prices, specials and sales etc), ability to display open hours, location map, news and more. The theme is mobile friendly with responsive design and the code is small, light and fast to ensure you have a fast loading and search optimized restaurant website. 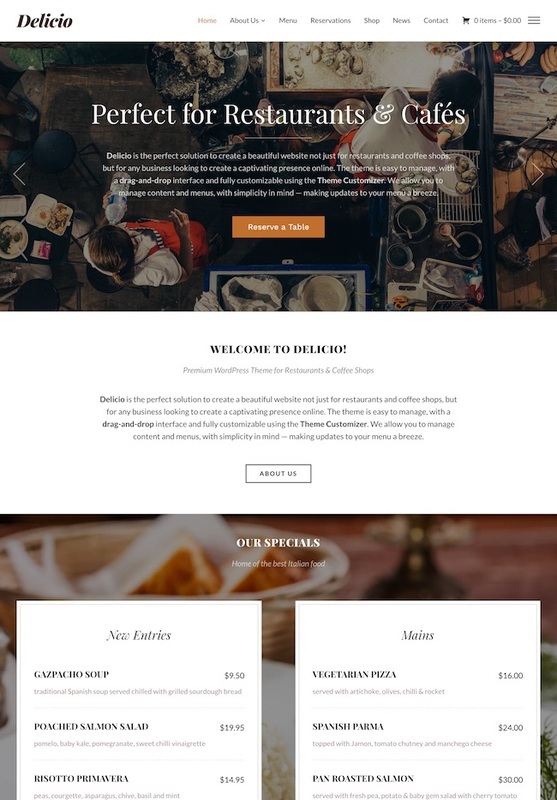 Delicio is a beautiful and stylish WordPress theme for restaurants, cafes, bars, coffee shops, and other businesses. The premium theme from WPZOOM has a mobile friendly responsive design and lots of great features and functionality to make it easy to manage and customize. Some of the key features and benefits include: a drag and drop page builder (create countless custom page layouts using the content and media shortcodes), easy to use food menu page (build with drag and drop), restaurant reservations (using the free Restaurant Reservations plugin you can accept reservations and table bookings online directly on your website), visual customizer (easily customize colors, fonts, background, logo, menu, widgets and more), WooCommerce ready to sell and accept payments on your website, sticky menu, sliding sidebar panel, theme options panel, easy translation, automatic updates, and more. CaféCultura is a great looking mobile responsive restaurant WordPress theme designed for boutique coffee shops, off-beat cafes, specialty restaurants, wineries, local eateries and other food establishments. The CaféCultura theme has a powerful and flexible food and drink menu with a simple and intuitive menu builder. It also has markers for food types (vegetarian, spicy etc), single and double column layouts, 28 custom dietary icons (halal, organic, kosher, fair trade etc), item badges and options to highlight specials and featured items, set discounted prices, and photos. Some of the other great features of the theme include: sources and suppliers page with map, lots of customization options (logo, colors, background, fonts etc), reviews page, front page promotions, events calendar, contact cards, chef and team member page, a mobile friendly responsive design and more. 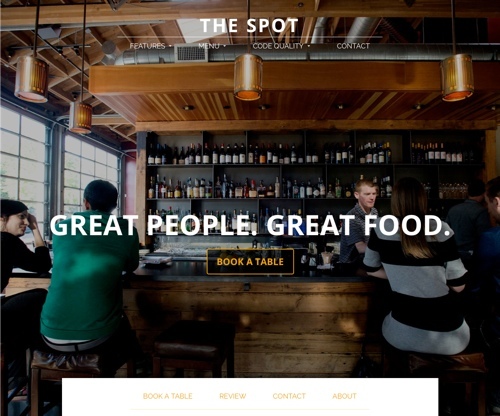 The Spot is a fantastic fully featured restaurant WordPress theme from Theme of the Crop. The premium theme has a confident, modern and vibrant design ideal for pubs, bars, gastro pubs, taverns, wine bars, clubs or any other type of venue with an active vibe. 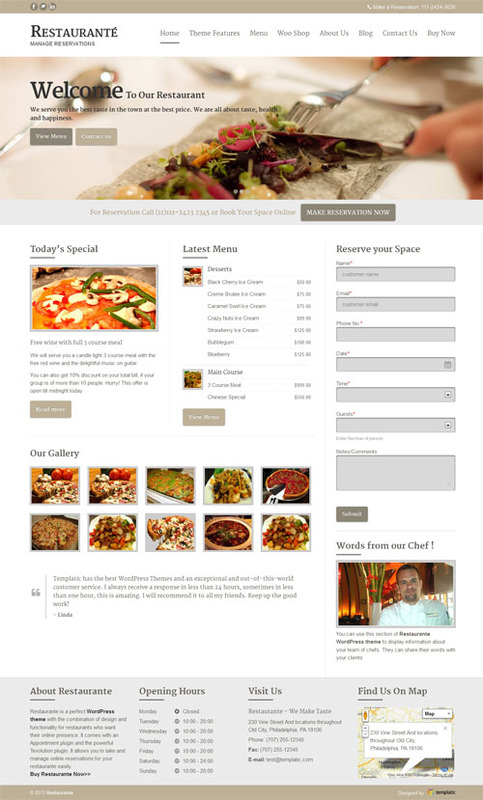 The Flavour is a classy and modern restaurant WordPress theme with a mobile friendly responsive design from ThemeFuse. The premium theme has all the features and functionality a restaurant needs in a website and a design that ensures your website stands out. The Favour theme would be perfect for any type of restaurant, from fine dining restaurants to casual and family dining, cafes, bistros, coffee shops, pubs, buffets and others. Some of the key restaurant specific features include: food and drink menus, events calendar, reservations page (and module), map and location, photo gallery, and restaurant specific icons. The theme also has a heap of other great features to make it easy to set-up, manage and customise to suit your needs. These include: lots of customisation options (you can change colours, backgrounds, fonts, icons and more), HTML5 slider, a sticky mega menu, shortocodes (to easily create your own page layouts), sidebar manager, multi-language and translation ready, contact form and more. 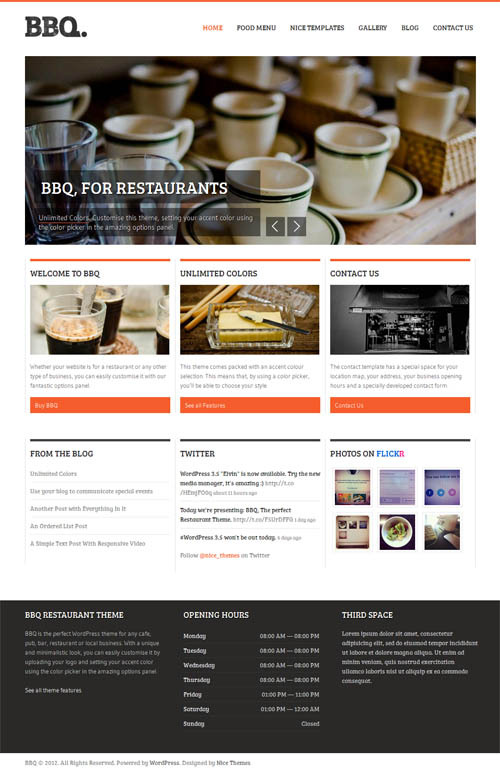 Resto is a premium WordPress theme for restaurant and bar websites from cssigniter. It has a contemporary and attractive design that will bring the diners in. The drag and drop homepage allows you to build the front page design exactly as you like. Some of the other features include: menu management (simple and clean design with multiple price options and specials section), events management (to manage events at your venue), reservation template (includes a reservation form or integrate your favourite reservations system), theme options panel, color variations, shortcodes (via a plugin), custom menus, localization options and more. 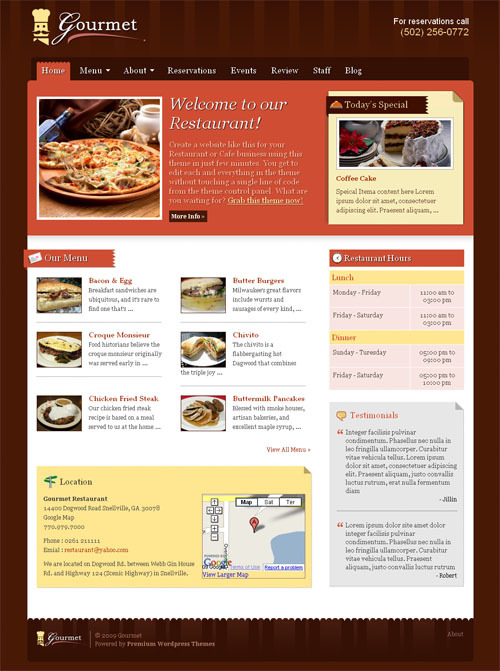 Taverna is a professional and modern restaurant WordPress theme from BizzThemes. The mobile responsive premium theme is ideal for all types of restaurants, pubs, coffee shops, pizzerias, taverns, bars, clubs, cafes and other food and entertainment businesses. 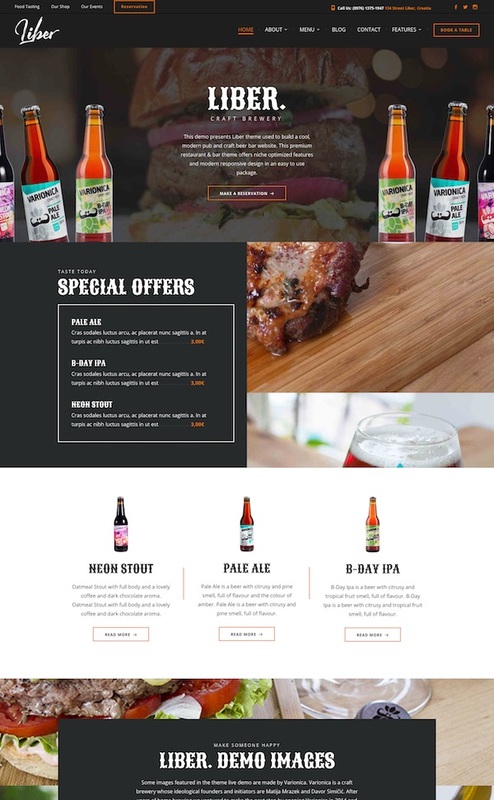 The Taverna theme has a contemporary and attractive flat design with a big customizable featured image on the homepage, parallax scrolling, and bold easy to read typography. Other features include: a menu to list food and beverages, WooCommerce integration to support online ordering and reservations, testimonials, contact forms, mobile navigation, tiled gallery module and more. Downtown is a restaurant WordPress theme from Tesla Themes designed for restaurant, bar, food, coffee shop and food catering websites. The premium theme has a clean, modern and mobile friendly responsive design with lots of special features for restaurant websites. Some of the key features of the theme include: a filterable menu, reservation form, recipe pages, parallax effects and stylish animations, custom widgets and built-in shortcodes, Google maps, social media integration, custom logo and backgrounds, Google fonts, custom posts (services, testimonials, staff members, calendar etc), and a powerful admin back end to easily customize the look and functionality of your website. The Café Pro theme combines elements of the popular Parallax and Foodie WordPress themes such as nice parallax effects, full screen background images, and a very clean and mobile friendly responsive layout. Daily Dish is a premium child theme for Genesis Framework with a very clean and minimalist design. The premium theme from StudioPress is designed to present your content (words, images, videos and more) in a really appetizing way and ensure your visitors focus on what’s important. 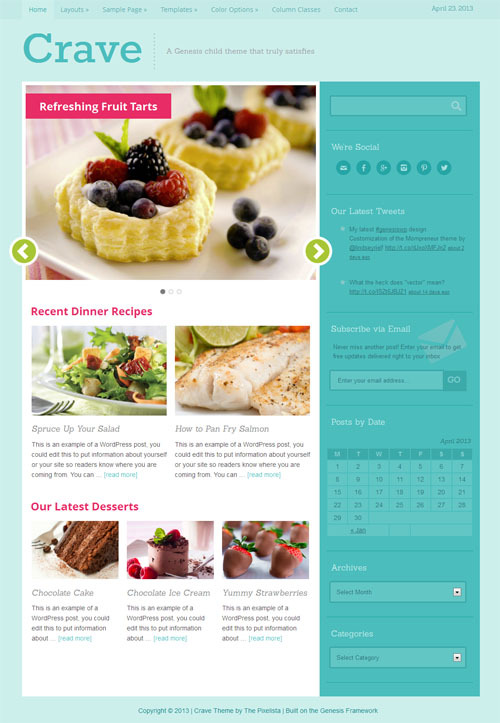 It Daily Dish theme would be perfect for foodie bloggers. Some of the key features of the theme include: a mobile friendly responsive design, crisp typography, a blog or magazine style layout, custom header and background, HTML5 markup, 6 page layouts, landing page template, theme options plus all the other great features and benefits of the Genesis Framework. 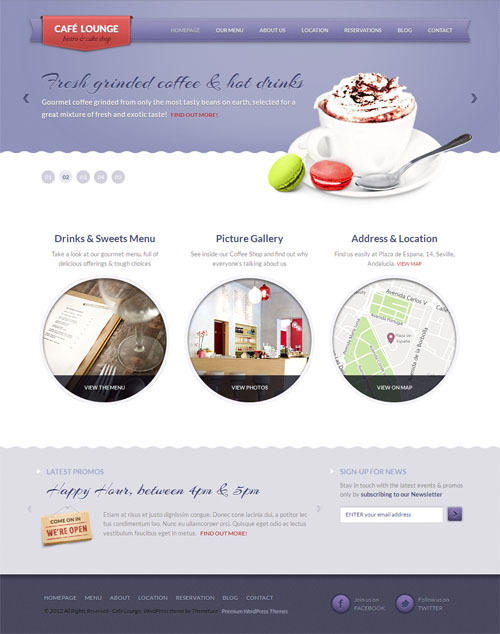 A premium business WordPress theme from Theme Fuse designed for coffee shops, bars, bistros, cafes, or restaurants. Features include a custom homepage layout with a creative slider, 3 colour variations, menu template, shortcodes, powerful options panel and more. 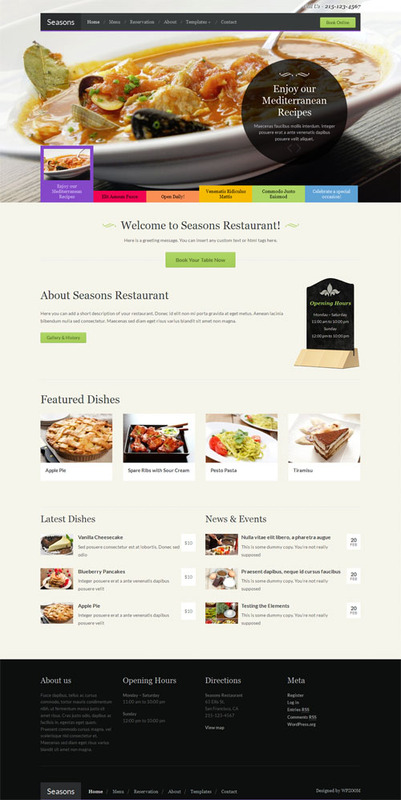 Seasons is a professional and elegant restaurant WordPress theme with a mobile responsive design. The professional premium theme from WPZOOM is perfect for restaurants, bars, cafes, clubs, pubs, and other businesses in the food industry. The theme features a custom homepage layout with a large and unique slider. It has two menu templates: one that will display food categories sorted alphabetically, and a widgetized template, in which you can order food categories any way you want. Plate Up is a bold and refined mobile friendly WordPress theme for restaurants. The premium theme from Theme of the Crop is tailored to the business needs of a restaurant with a design that emphasized online reservations, quick access to phone numbers, maps, open hours, reviews etc. to convert online visitors into diners. The Plate Up theme utilizes a number of plugins for the functionality including: a Food and Drink Menu plugin, Restaurant Reservations plugin for online bookings, the Good Reviews for WordPress plugin to manage and display your best reviews, and the Business Profile plugin to easy set up all of your contact details. Grill is an attractive premium restaurant WordPress theme with nice parallax effects and a mobile responsive design. The theme is ideal for restaurants, grills, cafe’s, bistro’s, bars, night clubs and everyone in the entertainment and events industry. 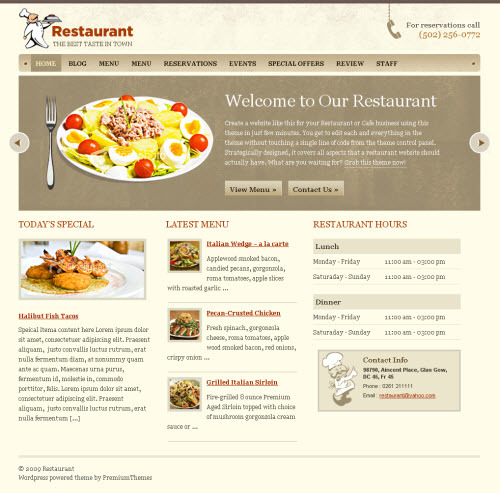 The theme includes built in functionality that restaurateurs need in a website. Features include: a table booking app, a food menu builder with images, drag and drop custom homepage and page builder, parallax builder, translation options and more. 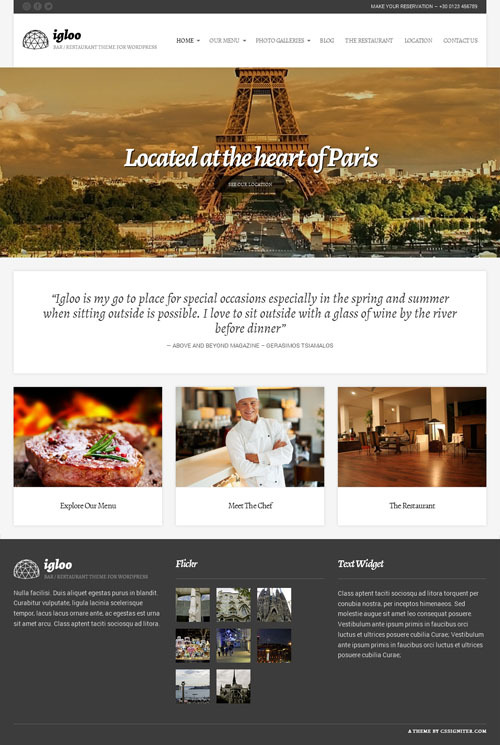 Igloo is an attractive WordPress theme designed specifically for restaurant, cafe, and bar websites. The premium theme from cssigniter is mobile ready with a responsive design that automatically adapts its layout to display perfectly on all mobile devices. The theme has a clean and professional design that designed to be simple and place the focus on your restaurant and food. It has a custom menu template so you can display your menu items with prices, a photo gallery section, blog, and 9 other custom page templates. A built in options panel, shortcodes and 6 pre-made colour scheme options allow you to customise the theme to suit your business. Yumblog is a fantastic mobile friendly food WordPress theme for food bloggers, foodies, food enthusiasts, recipe bloggers and others wanting a powerful and fully featured CMS quality food website. The responsive premium theme from UpThemes has a beautiful clean and modern design and integrates with a few select plugins for advanced page layout building and food and recipe functionality. Yumbblog includes Cooked WordPress plugin (a $25 value), a powerful recipe plugin that adds a lot of great functionality and makes it easy to set up a community powered recipe website. Some of the key features include: front end user recipe submission, 10 responsive recipe layouts, recipe search (with filters for category, cuisine, cooking method, and more), built in review system for user reviews, star rating system, full screen recipe view (users can easily prepare recipes by tapping the full screen view button, great for iPads and tablets in the kitchen), recipe videos (easily add recipe videos by adding a URL to a YouTube or Vimeo video), and more. The Yumblog also supports drag and drop page layouts with Beaver Builder plugin integration. The Beaver Builder plugin is an innovative new drag-and-drop page builder for WordPress that allows you to build amazingly simple, beautiful full-width pages in moments. You can build a page in a matter of seconds and customize text and images that are dropped into the page, even adding image galleries, parallax sections, and stunning video backgrounds. Restaurante is a mobile responsive WordPress theme for restaurants with reservation booking functionality. The commercial theme from Templatic has a stylish and professional design and is mobile ready with a responsive layout that will adapt to work on iPhones, Androids and all other mobile devices. The theme include a customisable menu template where you can add pictures, descriptions, prices, list different portion sizes and prices, and set menu items into different categories. It also includes a reservation module so guests can make bookings online. Espresso is a mobile responsive restaurant WordPress theme with a modern and flat design. The premium theme is built for restaurant and event websites with a built-in menu builder and full support for the WooCommerce, Gravity Forms and The Events Calendar Pro plugins. Some of the other key features of the theme include: a menu builder for your food, drag and drop page builder, page customizer to change the layout, show / hide items etc, options to change the colours and fonts etc, a blur slider, and more. 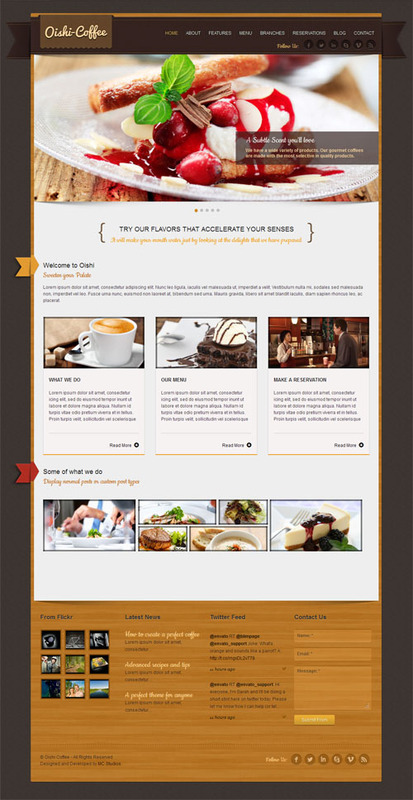 A premium WordPress theme from Theme Fuse designed for restaurant, cafe or coffee shop websites. Alternatively is can also be used for pastry, catering or recipe portal sites. 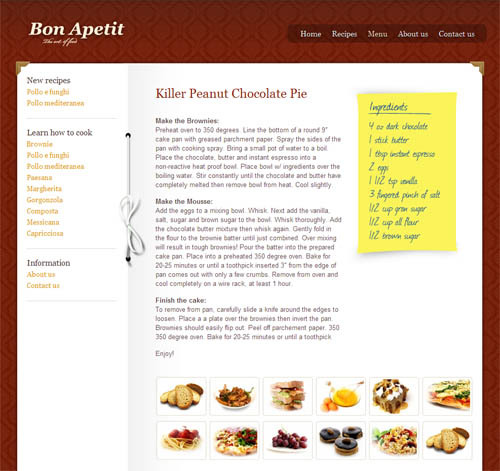 Features include custom menu and recipe pages, auto thumbnails, theme admin options page and more. 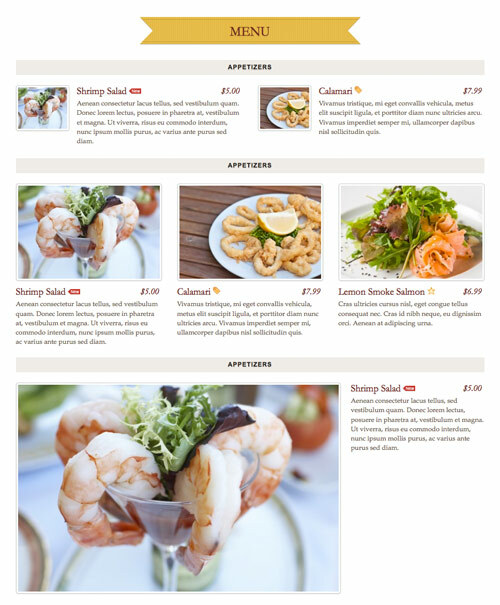 A premium WordPress theme from BizzThemes designed for restaurants. The theme includes an advanced and flexible menu that makes it simple to add new meals, style your menus and even create special offers for your customers. The theme uses a flexible layout engine that allows you to edit the layout and design for each page with drag and drop widgets. Other features includes 8 colour schemes, 21 widgets and extensive themes options page. 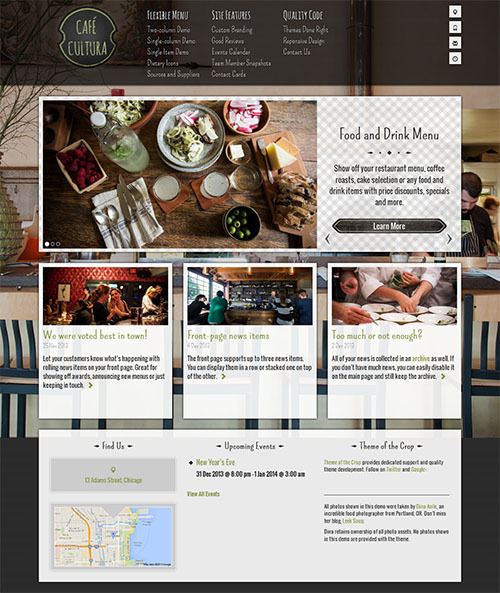 A premium WordPress business theme designed for cafe, restaurant and bar websites. This professional theme from Themify includes a custom menu page template with various layout options. Other features include a lightbox gallery for photos, Google maps integration, 7 page layout options, 7 colour schemes, theme options panel and more. Allows you to query items from any menu category or all. It comes with 3 different layout options: 2 columns, 3 columns, and large image list. An appealing and versatile premium WordPress child theme for the Genesis Framework. The theme is perfect for food blogs and websites, art and craft, baby, fashion and lifestyle, or other types of websites. It has 3 fresh and vibrant colour scheme options (default blue, citrus and berry) and 6 homepage layout options (magazine, magazine with slider, full posts, full posts with slider, post excerpts, and post excerpts with slider). The theme includes an options panel to help you easily set up and control your website and being a child theme includes all the other great features and functions of the Genesis Framework. The theme is available in the Community Marketplace section of StudioPress. 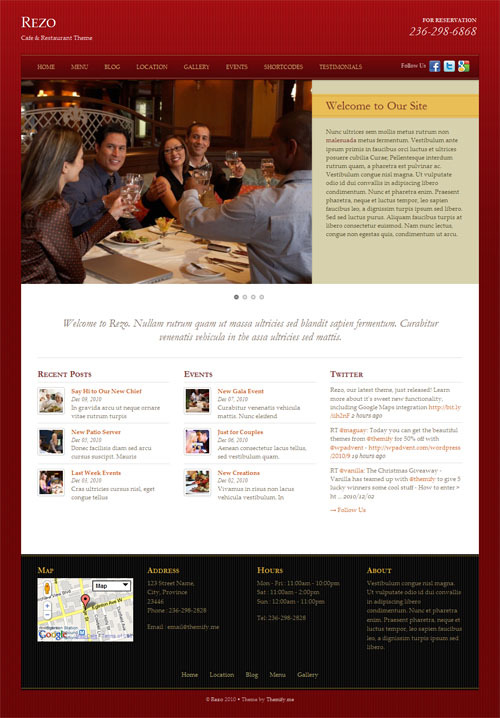 A smart and professional premium restaurant WordPress theme from Templatic designed for cafe and restaurant websites. The theme includes menu page templates plus other custom page templates, a backend control panel to quickly and easily set up the site, location and map section, a number of colour scheme options and more. A premium WordPress theme from WPZoom which could be used for restaurant, café, bar, business websites etc, or any other type of website that requires a CMS WordPress template. 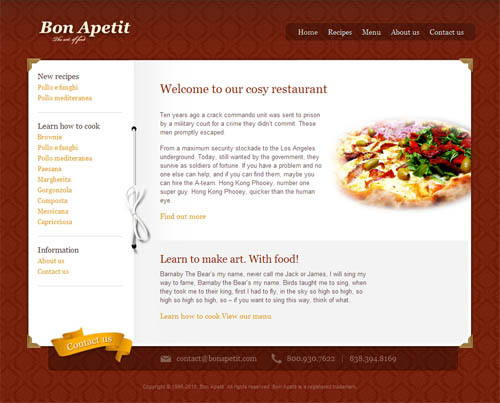 A premium WordPress theme designed especially for restaurant and cafe websites. Key theme features include: a fully customisable homepage, custom menu page template, and an advanced theme control panel that lets you configure theme settings without needing to touch the code. 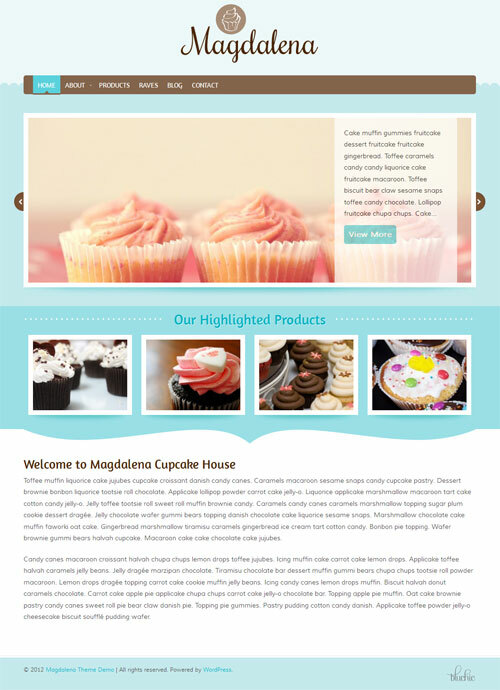 A chic food business WordPress theme from BluChic designed for cupcake, bakery and other food business websites. The premium theme has a responsive layout to automatically adjust to mobile and tablet views, theme settings options panel, custom widgets and shortcodes, and 2 colour schemes: pink and blue. Sweet Cake is a mobile responsive one page business WordPress theme. The premium theme has a sweet and creative design that would work well for cup cake shops, bakeries, ice cream shops, restaurants, cake designers or female oriented businesses. The one page layout lets you display a slider, information boxes, your products, prices, team / staff, social links, skills, and a map. It has a theme options panel, a wide 1200px grid system, intro animation effects, custom fronts and more. 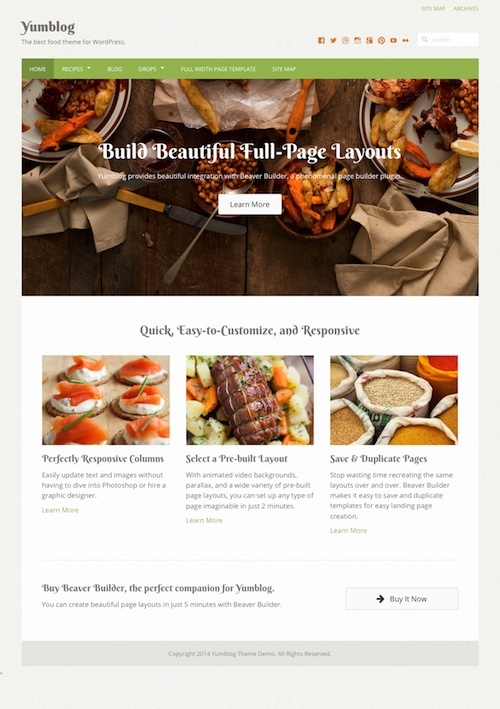 The Kitchen Table is a simple but very functional WordPress theme for recipe websites. The premium theme is super easy to manage and control and lets you display your recipes in a clean and easy to search format. Features include a mobile friendly responsive design, user layout control (various grid or list layout options), sticky menu, Font Awesome icons, custom header and parallax background effect, unlimited colour options, styling for ingredients, directions and photos, user bookmarking and more. 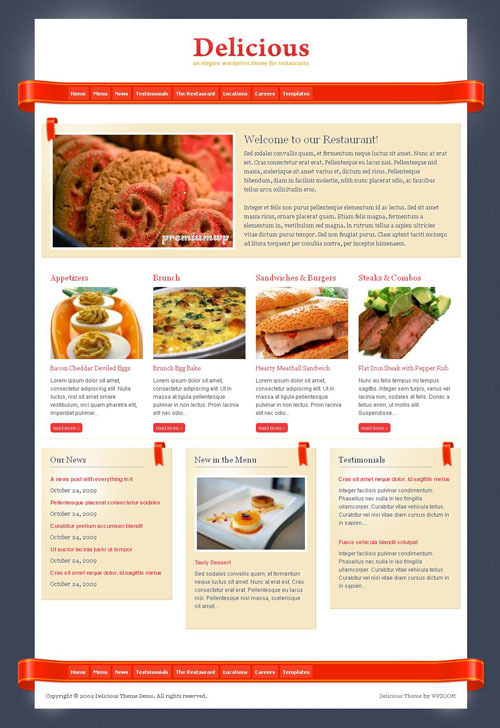 The Oishi WordPress theme is ideal for restaurants, coffee shops and other food businesses. Features include: 3 skins options, page builder, advanced options panel, slider, menu templates, WooCommerce support, a mobile responsive design, galleries, Google fonts, translation ready, custom shortcodes and more. The California is a mobile friendly responsive WordPress theme designed for restaurants, hotels, pubs, bars, coffee shops, cafes, wineries, and other food, beverage and hospitality websites. The theme has a unique and modern design and uses a lot of cool CSS3 and jQuery animation functionality. You can have a large homepage photo or HTML5 video background, and is powered by Bootstrap, HTML5 and CSS3. It has a nice menu template, events page, reservations page, gallery, blog page and more. Cuisine is a mobile responsive restaurant directory WordPress theme that will enable you to create a local restaurant directory website. 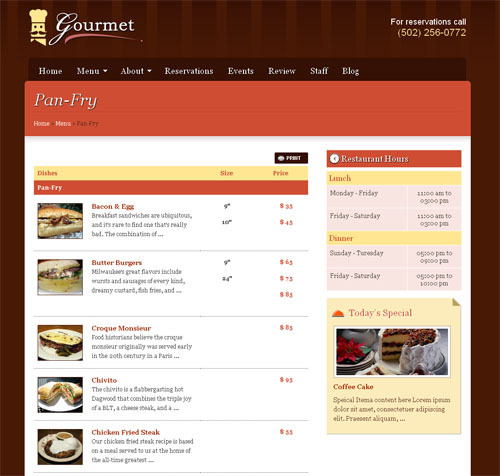 The Cuisine child theme is from Templatic and runs on the Directory Theme Framework with its powerful set of directory features.